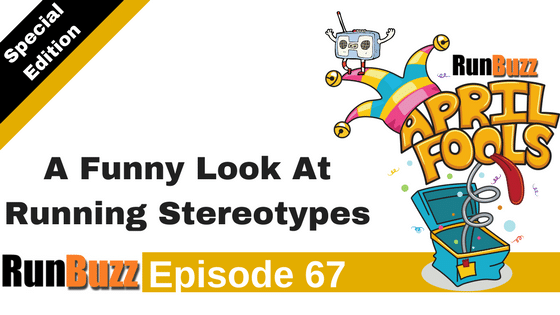 RB67: A Funny Look At Running Stereotypes - Whacky April Fool's Day Edition! RB67: A Funny Look At Running Stereotypes – Whacky April Fool’s Day Edition! In today’s episode, we have a special treat for you. Since today is April Fool’s Day, we figured we would prank you with a Saturday Night Live-like news episode specifically targeting some common running stereotypes. This ‘not so serious’ look inside the lives of runners will have you laughing out loud. Think of news you might find on ‘The Onion’. We are not responsible for any injury that may occur if you listen to this episode while drinking coffee. Since this episode is a must hear episode, there are no show notes for this episode. We highly encourage you to spread the fun to your friends and share on your social media channels! I hope you enjoyed this episode of the RunBuzz podcast. We will be back to our regularly scheduled format, next time.